I recently needed to add Dropbox support to a Lift app that I’m working on, and I didn’t find a full lock-and-key solution. After a little research and contributing to liftmodules omniauth, I was able to successfully write a file from my Lift app to my Dropbox account. After reading this blog post, you will know how to build a Lift application that allows a user to log into a Dropbox account, giving your application access to the files in a folder dedicated to the application. As with all of my tutorial posts, I’ve written it to be thorough enough for a newbie to follow. Before we dive in, let me give a brief overview of how all this works. You will register your application with Dropbox. There will be some authentication keys associated with it which your Lift application will utilize to identify itself. When I user is redirected to the link to log into Dropbox, the lift-omniauth module will use the keys and communicate with Dropbox to get a token for the user. You then pickup the token from the Omniauth API and create a Dropbox API client. With this client, you have access to the Dropbox folder for your application to read and write files as needed. First thing is to register an application with Dropbox. This lets them know of your intention to have users authenticate and grant you access to their Dropboxes. Sign up for a Dropbox account, if you don’t already have one. Once you’re signed in navigate to the App Console. 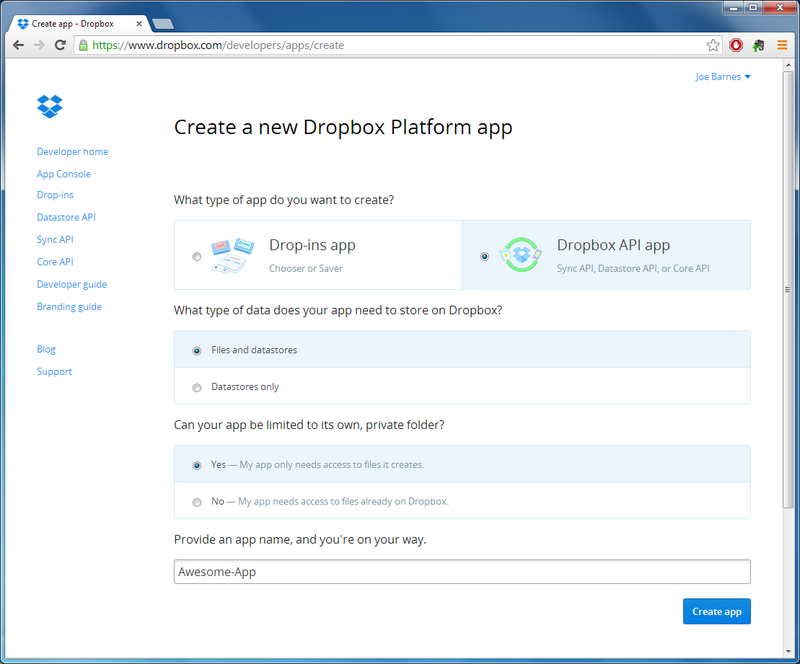 Mash the Create app button on the right to get to the Dropbox Platform app creation page. Select the Dropbox API app radio button on the right. Enter the name you want to use for your application. I’ve used Awesome-App because surely no one has done that yet, right? Once you submit the new application, you will get the config page for your app. The last thing we need to do in the Dropbox UI is add your redirect URIs. Enter http://localhost:8080/auth/dropbox/callback into the OAuth redirect URIs box and press the Add button. You’re welcome to add all of the URIs you plan to use, with the auth/dropbox/callback path. Just note that they must all be https URIs. Be sure to leave this page open. We’ll need the App key and App secret in a few moments. OPTIONAL: If you plan to have other people play with your application while in development, be sure to click the Enable additional users button. This will allow up to 100 Dropbox users to utilize your application. Now we will update your Lift project to utilize the lift-omniauth module. After you complete this section, the users will be able to log into the Dropbox UI and your application will be given an OAuth token for communicating with the Dropbox API. "net.liftmodules"  %% ("omniauth_"+liftEdition) % "0.8"        % "compile"
For successurl and failureurl, substitute as appropriate for your site. These are the URLs the user will be directed to after his interactions with the Dropbox login screen. // We will keep the token in a session variable. // Get the token and place it in session var. Now that you have the user’s token, you can call the Dropbox API. "com.dropbox.core" %  "dropbox-core-sdk"        % "1.7.6"      % "compile"
val awesomeStuph = "This stuph is awesome." That’s it! At this point, you are wired up to Dropbox and ready to create your application. The next step for most folks at this point will be to read into the aforementioned Dropbox Java API to know what all can be done. Excellent article and thank you for taking the time to document all of this. It is not clear that these are sequentially constrained and must appear in this order. Thankfully this is open source and peaking at the code shed light as to why. Lift presumes that you want to define the differences between run modes (development versus production) in external files like this rather than active decisions in code at runtime. If the defaults don’t work (and I was working with the basic lift demo app as supplied directly from GitHub and sadly mine didn’t) then you might get side-tracked into thinking active code is a better choice.